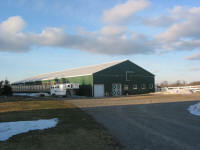 The Barn contains 9 stalls, feed room, large heated tack room and large aisles on the first floor. Upstairs is a viewing room with large plexiglass window overlooking arena, radio with arena speakers, hay storage and loft door access to below. A large parking area with plenty of room to turn trailers around and park. 8 - 10' x 10' Stalls, all with soft stall flooring, individual light, corner feed bins, hay racks and water buckets. All stalls have grilled sliding doors with top latches. 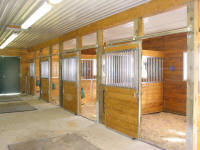 One stall is a large stallion stall - 16' x 10' has padded walls as an additional feature. Large, roomy insulated tack room with countertop, radio, bench and plenty of saddle racks. Completely enclosed 20 acre Cross Country Training Field of gently rolling land graded to allow for galloping and canter conditioning. Cross Country Jumps designed for gentle introduction to cross country obstacles for young or inexperienced horses. 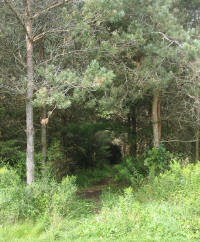 (currently under construction) banks, ditches and log jumps. The jumps are designed to encourage young horses and provide varying degrees of difficulty from pre-entry to training. Enclosed gently sloping grass jumper field. Flat areas and gentle slopes provide an opportunity to introduce jumps on grades up and down hills. Schooling Jumps and jump fillers including coops, flower boxes and barrels. Wide trails through a 15 acre softwood forest designed to encourage horses to experience and enjoy hacking through forests and fields. Bright and well lit 65' by 160' Indoor wood/steel arena with heated viewing room, mirror wall and natural sand/shavings footing. Large lexan panels allow plenty of natural light and also encourage riders to focus their horse's attention. Large Roll Up doors provide access to jumper and dressage rings or to go for a nice cool down hack in the trails. Window panels open to increase airflow. Radio and speakers for riding to music. Arena is available for rental. Contact us. Indoor washing area and Outdoor Washstall with rubber mats for show preparation, cooling off and wound care.